This morning, when I awoke, Psalm 46 was on my mind. So many people are living in fear. You can see it in online conversations and in the news. But God is love, and perfect love casts out all fear. Whatever it is that is troubling you, allow God and His perfect love to cast out your fear. May the God of love and of all peace fill you with His peace today. I was immediately struck by a one-word answer: disappointment. 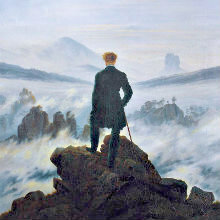 Christians in the West become disillusioned when we anticipate or expect an outcome and it does not meet expectations. The next time we confront a similar situation, heightened fear results. And I tell you, ask, and it will be given to you; seek, and you will find; knock, and it will be opened to you. For everyone who asks receives, and the one who seeks finds, and to the one who knocks it will be opened. What father among you, if his son asks for a fish, will instead of a fish give him a serpent; or if he asks for an egg, will give him a scorpion? I once had someone confess to me a lack of faith in God specifically because of me. How so? Because it made no sense to that person that someone who sought so hard to follow after God could have so many rotten things happen to him at the worst possible times as I did. That person had personally witnessed faithful, God-loving Dan asking God for eggs and getting what he thought were scorpions instead. Why serve a God who treated His most ardent followers that way? What is behind that thinking? A Western view of entitlement and middle class privilege. That said, when I look through the Scriptures, what I do not see is any promise of God that those who love Him should have a material expectation beyond God providing food and clothing. The Father promises not to let His children starve or go naked, but He makes no promises—for this life at least—that they will inhabit mansions. Read that concluding sentence again. What is God most concerned about giving us? His Holy Spirit. Him we can have without limit. It’s not about stuff. It’s about God giving us more of Himself. The problem for us in the West is that we’re not satisfied with more of God. Truth is, we’re not even satisfied with our daily bread. Or with enough clothes to keep us from being naked. Back in Jesus’ day, and throughout most of human history, if one had food and clothing, that was enough. Because too often, those items could not be assumed. Sieges during war rendered even a crust of bread a luxury, and war was a way of life. Enemies burned fields and stole livestock. Armies laid siege to walled cities for months and years until the people inside broke. God tells us in His Word that His children should not worry about this. He will provide food and clothing. For those of us in the West, though, that’s not enough. Basic needs met? Pishaw! At minimum, we must have what the other guy has. Or more. Because having more than the other guy proves our smarts are better than his. Shows how we’re better all around. Wiser. More successful. In the case of Western Christians, having more than the basics says that whatever we’re doing religiously, we’re doing it right. We are holier. We are more committed. Our doctrine is the right one. That poor slob of a failure over there? He’s reaping what he sowed. His doctrine was bad. He sinned. He let God (or in all too many cases, the pastor or the local church) down. The loser. So if we have less, we get disappointed. If we think we’re doing this Christianity thing right and God does not marvelously fill our material coffers, then He is being a grinch. Even if we’re not living up to some “Christian” standard, we’re mad at God anyway for not dishing enough grace to help us keep up with the Joneses. That disappointment with our perception of God’s provision leads to fear. Fear that we’ve sinned somehow. Fear that our doctrine is wrong. Fear that our entire faith has been in vain. Fear that perhaps God is not there. Fear that if God is not there, then life is all on our shoulders, and it looks like we already screwed up that life or will do so in the future. Fact is, the myriad fears we see in the Church today have basis in whatever past disappointments with God we let fester. Despite what God may think is best for us, we think He didn’t come through. Ultimately, it’s a complete breakdown in faith. This is rampant in the American Church. In some sectors, it’s prosperity gospel teaching that breeds this problem. In other sectors that consider themselves above prosperity gospel teaching and who look down their pious noses at any fool who believes such things, it’s the pride of American Dream living that breeds it. Envy and pride. Unrestrained, that pair will always lead to disappointment, which leads to fear. In the end, all you and I can do is be the person God has made us now. We turn to Him and can expect Him to give us food, clothing, and—without measure—His Holy Spirit. Comparing our reality against anyone else’s is wrong. If anything, I think the Bible teaches that material things only serve to weigh us down, to become the very worries that choke the seed we read about in the parable of the sower. It’s not so much that we ask our Heavenly Father for an egg and He instead gives us a scorpion. It’s that we want a factory filled with eggs and want almost nothing of our Father Himself. And we get disappointed with Him when we see evidence that God might have something different for us. Then we become afraid that we will never get our egg factory and the world will think less of us for that “lack.” Suddenly, everything looks like scorpions. More of you, Lord, and less of everything else. Let us eat our bread and wear our clothes with glad, thankful hearts, and a deep, profound love for you and for others, while we treat everything else we may receive in this pre-eternity like gravy. For where our treasure is, there will our heart be also. Recent world and national events have brought increased attention to issues of the right to bear arms and of personal defense. These important issues deserve discussion. The Bible demands we understand its contents in context, which ranges from the entirety of the Scriptures down to “scenes” within the biblical narrative. Get too granular and context is lost. I would go so far as to say misunderstanding context is the major error committed with biblical texts. This happens, in part, because we mistakenly reduce the Bible to chapters and verses, artificial points of organization that were added in the 16th century, long after the canon was approved. The original text contains no chapter and verse numbers. Chapters and verses compartmentalize the text, and this works against understanding a broader context. Before we exegete the Luke passages, a personal disclosure: My father was a lifetime NRA member, and I grew up with guns in my household. In my youth, I won marksmanship awards. Later, I taught marksmanship and gun safety. I am experienced with personal firearms. Readers should know this because I want the Scriptures to stand by themselves and not on me as a biased interpreter. And he came out and went, as was his custom, to the Mount of Olives, and the disciples followed him. And when he came to the place, he said to them, “Pray that you may not enter into temptation.” And he withdrew from them about a stone’s throw, and knelt down and prayed, saying, “Father, if you are willing, remove this cup from me. Nevertheless, not my will, but yours, be done.” And there appeared to him an angel from heaven, strengthening him. And being in an agony he prayed more earnestly; and his sweat became like great drops of blood falling down to the ground. While he was still speaking, there came a crowd, and the man called Judas, one of the twelve, was leading them. 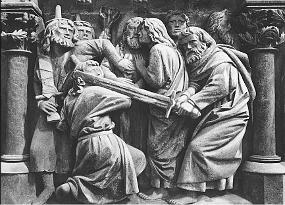 He drew near to Jesus to kiss him, but Jesus said to him, “Judas, would you betray the Son of Man with a kiss?” And when those who were around him saw what would follow, they said, “Lord, shall we strike with the sword?” And one of them struck the servant of the high priest and cut off his right ear. But Jesus said, “No more of this!” And he touched his ear and healed him. Then Jesus said to the chief priests and officers of the temple and elders, who had come out against him, “Have you come out as against a robber, with swords and clubs? When I was with you day after day in the temple, you did not lay hands on me. But this is your hour, and the power of darkness.” Then they seized him and led him away, bringing him into the high priest’s house, and Peter was following at a distance. The setting comes at the end of Jesus’ earthly ministry. He will soon be crucified. He is gathered with His disciples in the Upper Room, having celebrated the Passover meal and having dismissed Judas, who will return with the Jewish governing authorities that will arrest Jesus. Jesus begins by referring to His earlier sending out of 72 disciples in pairs, which included the apostles, to minister to people in the region (see Luke 10:1-23 for details). With all that will go down in the next few days, why get a sword right that moment? For personal defense months after Jesus is gone? Or to fulfill in the next few hours a specific prophecy about Jesus as Messiah? Yet it was the will of the LORD to crush him; he has put him to grief; when his soul makes an offering for guilt, he shall see his offspring; he shall prolong his days; the will of the LORD shall prosper in his hand. Out of the anguish of his soul he shall see and be satisfied; by his knowledge shall the righteous one, my servant, make many to be accounted righteous, and he shall bear their iniquities. Therefore I will divide him a portion with the many, and he shall divide the spoil with the strong, because he poured out his soul to death and was numbered with the transgressors; yet he bore the sin of many, and makes intercession for the transgressors. The sword-bearing company of the Messiah puts Him among the transgressors, men of violence, which we will soon see played out. What does Jesus mean by “It is enough”? Enough swords to arm each of them for personal defense? No, there were 11 disciples now. Enough swords to provide self-defense for pairs of them, as they had been sent out earlier with the others? No, since there were only two swords for five and a half pairs. No, the two swords were enough to fulfill the prophecy of Jesus being numbered among the transgressors. Jesus and His disciples then move to the Mount of Olives. Jesus warns them not to fall into temptation. What might that temptation be? To fall asleep at a time when Jesus needs their comfort is certainly one case. But what else might a band of armed men be tempted to do? What is the human reaction to an upcoming confrontation that might go from temptation to action? They already failed to stay awake. but Jesus continues to refer to temptation. Why? “Lord, shall we strike with the sword?” And one of them struck the servant of the high priest and cut off his right ear. “No more of this!” And he touched his ear and healed him. Jesus rebuked Peter’s action against a perceived attacker. Further, Jesus demonstrated the proper counter-response to violence: healing. 1. All who take the sword will perish by the sword. Jesus does not see the sword as an answer; it will boomerang on those who use it. 2. Supernatural options greater than the sword exist. In this case, angels. Solutions exist that are unseen by those who are blind to them. 3 The sword was wielded so that the Isaiah passage about transgressors might be fulfilled. By their actions, what did the governmental authorities consider Jesus and His disciples? Robbers, transgressors. Later, who did the people choose to free instead of Jesus? Barabbas, a robber. Who was Jesus later crucified between? Robbers. Isaiah prophecy fulfilled: The Messiah, Jesus, was numbered among the transgressors. Now that we have explored this passage from Luke 22, what should we ask ourselves? Are transgressors considered to be “good people”? In what ways should Christians aim to be transgressors or not? According to Jesus, what is the end of those who take the sword? According to Jesus, are there other options beside the sword? What might they be? In what ways are Christians tempted to respond to difficult situations with human solutions rather than spiritual ones? Is Luke 22:36 a proof text for Christians to take up arms in self-defense? Why or why not?